Big surprise...I bought a new kitchen gadget! This is the OXO cherry pitter. I couldn't take another summer of cutting the pits out of cherries for my 2 year old, and this was just what I was looking for. Pitting these was a breeze. And what else do you do with all those pretty pitted cherries? Why, make pie, of course. I wanted to be all cute and stuff, so I made it in a 8x10 baker, with stars for vents. Who says I have to make my pie round? And, of course, I got a new Williams-Sonoma catalog in the mail today, filled with no less than a dozen things I just have to have. Look at these. Now those pies are really stinkin' cute! Guess what I went and bought today? :-D Yep the pitter and two of the cute little pie making shapes. :) Just pitted my cherries and now off to get cookin! Yum -- I'll be right over. 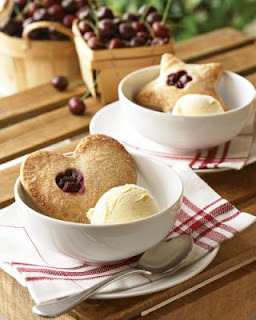 I have been looking for a GREAT Cherry Pie Recipe for weeks. I think I will try this one because not only does it sound delish but it also sounds so easy. Thanks for sharing it. Plus I MUST find one of those cherry pitter things. OH MY HECK!! I hate pitting cherries but I think i could cope with it if I had one of those!! Thanks again for sharing!! What a fun post! Your pie was adorable! ...and also perfect for 4th of July. Great dessert. I love the star cut outs! My hubby loves cherry pie -- and making it in a 9x13 pan is a great idea. Thanks! Your recipe made me laugh, because I would be much more likely to MAKE the crust and BUY the filling... exactly the opposite of you. :) But, this looks easy enough that I might just give it a whirl. Great minds think alike: I posted a super-easy Strawberry Pie recipe for WFMW today... it's one of my favorites!